Born from the fortunate experience of the Azimut 100 Jumbo, the new 105' of the Flying Bridge range built in the Viareggio-based yard of the Azimut-Benetti Group inherits from this model only the Azimut typical stylistic features. 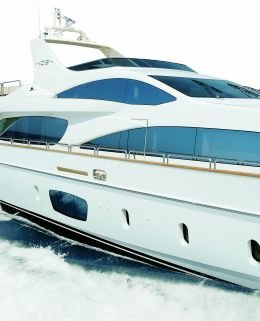 For further information contact: Azimut Yachts; via M. L. King 9/11; 10051 Avigliana (Turin, Italy); tel. 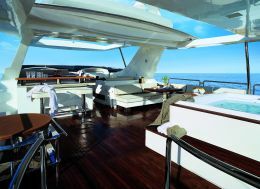 +39 011 93161; fax +39 011 9367270; website: www.azimutyachts.com. Undoubtedly the Azimut 100 Jumbo was a highly successful model if we consider that it has sold 35 units over a production period of ten years - a remarkable number for yachts of this size. The yard obviously felt the need of introducing a new model, with innovative lines and technical solutions, between the 98 Leonardo and the range flagship Azimut 116. 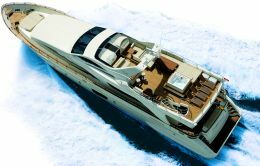 The first unit, launched in spring, made her debut at the most important European Boat Shows, but the second unit, specifically designed for the United States market was introduced at the Miami Boat Show last February. The first Azimut 105 Principessa was chartered during the summer season in the Mediterranean and at the moment she is experiencing the second chartering season in Mexico. She was built with a special eye to the needs of long-term and demanding cruises with many guests. This flying bridge motoryacht, designed by Stefano Righini, has two and a half decks. Through the long side windows plentiful natural light is shed on the spacious saloon. All interior spaces are also exceptionally bright thanks to the large windows on the sides, which also offer an extraordinary close contact with the water element. 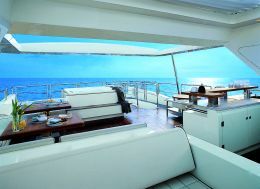 The relationship between guests and yacht when sailing as well as when moored or at anchor is highlighted by the layout of the ample sundeck fitted with two canvas rigid roof structures sheltering three fourths of the deck, which includes four different areas dedicated to lunching and lounging. The flying bridge, just like the rest of the yacht, was designed taking into consideration the chartering needs, thus several accessories were fitted: a barbecue, a teak and marble bar counter, a whirlpool, chaises longues plus wide sunpads. The bow area of this deck includes to port the open helm station and to starboard a sitting area with coffee table. Again, in view of chartering and guest privacy, there is a large sunbathing area with a wide and comfortable sunpad forward, in the bow area of the main deck. 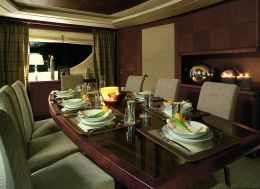 The cockpit is designed as an open-air dining area and it includes a comfortable settee, a dining table and accessories such as refrigerator and sink. From here access to the garage is via an appropriate hatch. Architect Carlo Galeazzi, in keeping with the excellent stylistic work of Righini designed the interiors on the basis of the same themes used for the smaller Azimut 75', but including richer details for greater elegance and comfort. According to Galeazzi, the boat is to be regarded as an ideal extension of one's own home by the sea, therefore the decorating elements that he suggests in this circumstance are like those that the Owner may have at home. Sand-and-dark-gray mélange, open-weave upholstered large sofas and armchairs can be moved to adapt the saloon to the different needs of the guests. Furniture is in opaque dark cherrywood and the perpendicular grain creates a pleasing three-dimensional effect. Consonant with the seaside-home concept, the furniture lies on a high quality woolen carpet with large white squares and drapes brush the floor. Colors used for the interior decor are light, neutral and enriched with leather insets. Simple and squared ceilings have lacquered and opaque insets contributing to the three-dimensional effect. Daylight in all spaces is guaranteed, as mentioned above, by the ample windows and artificial lighting is diffused by the wooden and upholstered back-lit panels. 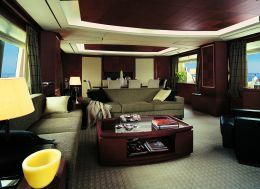 The interior layout was designed in consideration of chartering needs. The yard offers two standard versions in addition to the one described below. In the first version the master suite is forward on the main deck and the four guest cabins are on the lower deck. In the second version the cabins are all in the lower deck and the living areas and those dedicated to daytime activities are on the main deck. In the case of Principessa, the ample saloon on the main deck, accessible through a large glass door, includes a bar counter to starboard, a sitting area to port with two sofas each seating three, two small armchairs and coffee tables, a TV cabinet with flatscreen on the side. 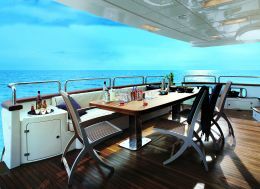 On the same deck there is the dining area, with a tempered glass table and ten small armchairs. 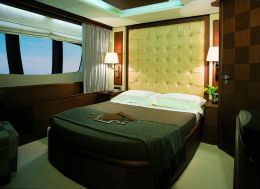 Principessa, as one of the two versions proposed by the Viareggio-based yard, has the master suite on the main deck. It includes a king size double-bed with storage underneath, a small living room with two armchairs and table, the full-beam en suite bathroom on a lower level with whirlpool, TV set and a large shower stall with seat and hydromassage column. 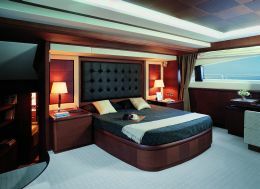 On the lower deck aft there are two VIP symmetrical guest cabins with vanity corner - illuminated by ample trapezoid windows with one rounded side - and two twin-bed cabins forward. 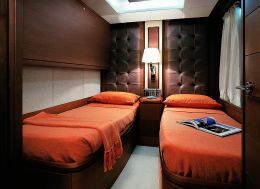 All guest cabins have en suite bathroom and all beds have storage underneath for storing luggage before long cruises. For maximum comfort under sail, the yard paid special attention to eliminating engine noise and vibrations. The engine room is easily accessible and it includes two 2,000 hp MTU engines which combined with the semi-planing hull propel the yacht at a maximum speed of 27 knots. Principessa's range at the average speed of 24 knots is around 720 miles with an average consumption of 500 l/hr of fuel for approximately 30 hours. The second unit of this modern Azimut exemplar was delivered to the Owner in January, the third one shall be delivered in May, the fourth one in July in Mexico and the fifth one is already under construction and should be ready by August. These numbers show that the 105' is destined to repeat the fortunate experience of the 100 Jumbo, which since her debut, as was the case of Principessa, attracted so much attention as to later gain an enormous success on the international market. 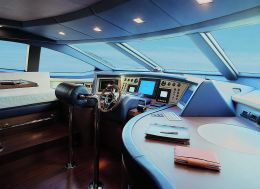 Undoubtedly, Azimut creates prestigious and modern yachts without ever forgetting the technical criteria of a sailing vessel: comfort and aesthetics are important features, yet safety and reliability are the main themes of each design, even if concealed by sophisticated layouts and deluxe finishing touches.